Asus and NVidia are not exactly pushing the memory clockspeeds of these new cards. 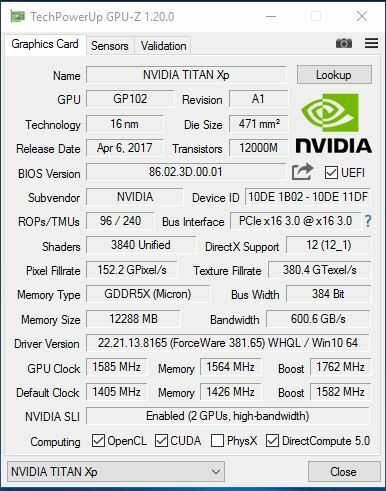 Here is a Titan Xp, check out the default and overclocked memory speeds, this is with the full 12gb of memory too. The memory bandwidth is not bad either. Have to allow for the silicone lottery - I agree though there really isnt a huge amount to talk about hence the lack of tests - cooler was good though! It is still an interesting card though, unfortunately most people are focusing on the 1080 Ti these days and overlooking cards further down the range. Your mini review was still an interesting read for me though, it is just that with a premium card like the Strix I would have thought that Asus could have gone a bit higher on the memory speeds. It is also good to see the card come with an improved cooler and lower temps are always welcome. If there had not been so much going on at the moment with new GPUs and CPUs just about to launch I may have been tempted to get one of these new Strix 1080s as I already own a Strix 1060 which I really like.